I am such a nerd when it comes to books about words or the origin of words. I just love the English language. So, I loved Phil Cousineau’s book Wordcatcher. 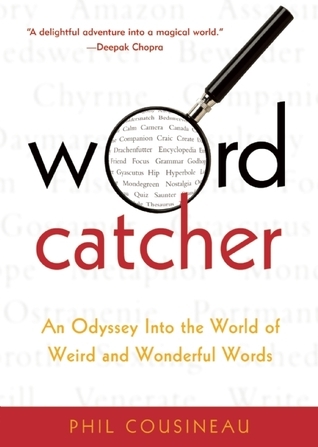 This book was a fascinating exploration of the origin of many common words. To be honest, a lot of books like this are kind of dry and have to be read slowly, but Cousineau does a great job at adding levity to this subject. His entries for each word are relatively short but contain a lot of fascinating information. Personally, I loved reading about the word origins for “fornicate” because I even learned some additional history from this entry. I think that all word nerds will love this delightful book. It’s almost like candy – small bon bons of word knowledge instead of a really dense dessert that takes a month to get through. This book can be digested easily and quickly.